A late-career Tennessee Williams play features hallmarks of his earlier work, but still brings some originality. Lane Williamson reviews. Tennessee Williams wrote an astonishing number of plays. Beyond his most fruitful period in the mid-40s to mid-50s, he wrote and produced continuously until his death in 1983. These later plays lurk in the shadows of our discourse about Williams because most of them aren’t very good. They are weak grasps to hold on to what made his name and reputation, tired steps retreading the past. There are, though, some occasional flashes of the groundbreaking dramatist and a few of these glimmers appear in his 1979 play, A Lovely Sunday for Creve Coeur. Currently revived by La Femme Theatre Productions, A Lovely Sunday follows Dottie (Jean Lichty), a “marginally youthful” teacher, and her older roommate, Bodey (Kristine Nielsen), before their Sunday picnic at Creve Coeur Lake. Both exist, in Williams fashion, inside their own delusions: Bodey wants to set Dottie up with her twin brother, Buddy, but Dottie wants to sit by the phone and wait for a call from her principal, T. Ralph Ellis. Ralph has recently shown Dottie how his car seats recline, if you get the drift. Dottie’s coworker, Helena (Annette O’Toole) arrives, nose in the air, and tells Bodey that she and Dottie are getting an apartment together in a more fashionable part of town. Helena thinks she is rescuing Dottie from unsavory living conditions, but Dottie’s motivations are more complicated and Bodey has some truths to spill. The most distinctive aspect of Williams’ play is that it features four women (an upstairs neighbor also appears) and no men. Though they don’t appear, the topic of conversation is often centered on these invisible men, but the play does pass the Bechdel test. 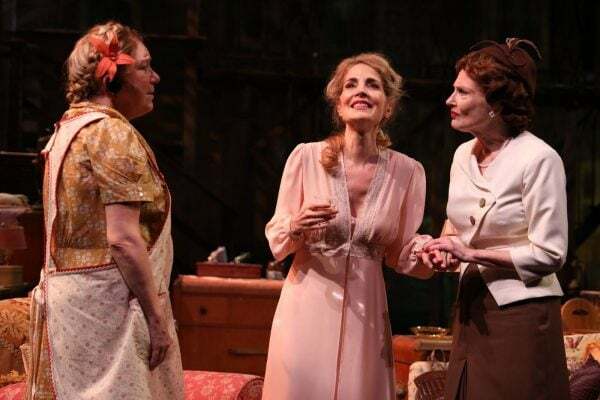 Dottie is a rehashing of Williams’ Southern Belle archetype; her waiting by the phone for Ralph is reminiscent of Blanche’s insistence that Shep Huntley will call in A Streetcar Named Desire or Alma staring out the window at John Buchanan in Summer and Smoke. She is single-focused on getting the man and does not care how this affects Bodey. Bodey tends to Dottie, almost as if she is her daughter. Though their ages are not too disparate, Dottie’s lack of emotional maturity facilitates a maternal relationship with Bodey, who has become her caretaker. As Helena threatens to disrupt their bond, Bodey doubts that Helena is prepared to accept the added responsibilities she bears. Williams allows the dynamic between the three main characters to develop through small parcels of dialogue that spur shifts in power and cause a renegotiation of how they can move forward. Helena thinks Dottie is grateful to get away from Bodey, but Dottie only wants a better apartment to entertain Ralph. Helena and Bodey both know that Ralph is engaged, but don’t tell Dottie so she can linger in her fantasy a little longer. All the while, Bodey just wants Dottie to join her at Creve Coeur. The women counterbalance each other and each adjustment in one causes a responsive adjustment in the others. This structural back-forth-and-sideways is captivating at times, but bloats the play. Williams is not known for his brevity, but here, in an intermission-less evening, the extraneous material is especially apparent. Nielsen and O’Toole spend much of the play sparring while Dottie hides in the bedroom. These two gifted actresses are alert and connected, feeding each other to great effect. Nielsen’s most valuable skill is the ultimate power she possesses tucked under her wacky comedic exterior. When she lets it roar up to the surface, she is formidable and terrifying. That she has usually been hysterically funny just before only accentuates the adeptness of her craft. O’Toole is an unending source of unique choices in physicality and line reading and finds a feast in Helena’s snooty judgment. Lichty is adequate as Dottie, but was often inaudible, even in the small space of the Theatre at St. Clement’s. Bodey and Dottie’s efficiency apartment is described several times as having clashing, garish colors, but the set by Harry Feiner has mostly muted, inoffensive tones. Feiner has crammed the playing space with so much furniture that the actors cannot move in any natural way. Instead they are forced to turn sideways and wiggle through tiny pathways, limiting the flow and pace of the staging. The set has no physical walls dividing rooms and sometimes the characters speak directly through the place where they’ve previously acknowledged a division of drywall to be. There was little consistency to the rules of the space Feiner and director Austin Pendleton created and the stage images are less than captivating. A serendipitous Williamsian aspect of the physical production is a series of ceiling fans slowly spinning above the audience. Tennessee devotes a portion of almost every play to discussions of the heat and his characters are frequently fanning themselves for a reprieve. Even now, as the seasons transition from our humid New York summer to the briskness of fall, the circulating air was welcome. These fans are part of St. Clement’s space, not installed for A Lovely Sunday, but they added an immersive touch to the production.